Time flies by and here we are in the middle of the year 2018 and welcome our customer and partner community to SAPPHIRE NOW 2018. At the beginning of this year, I published the first information about the consumption based license model for SAP Cloud Platform in my introductory blog. 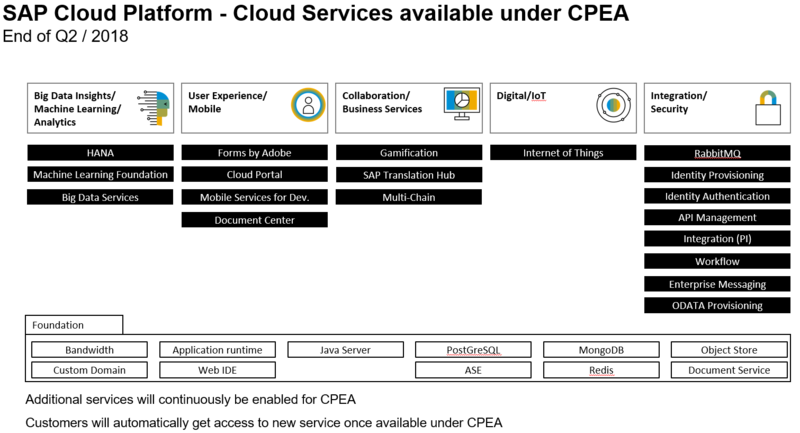 Here I had outlined the countries where we started to make the new Cloud Platform Enterprise Agreement (CPEA) available and which services were applicable for Cloud Credits. In the meantime we have been busy and extended the scope both from an applicable services perspective and from a country perspective. Now many more customers can take advantage of the new license model in addition to the existing commercial agreement. At the beginning of 2018 we started to engage in 5 markets (Germany, US, Canada, United Kingdom and United Arabic Emirates) to test the waters and validate that our processes actually work. We had pretty good traction and extended now the availability of CPEA to more regions. We have grown from five countries to thirty-nine which cover now a large portion of our installed based customers in regions Europe, Asia Pacific and Middle-East and North Africa. With this progress we can offer way more customers the flexibility and simplicity for adopting SAP Cloud Platform under the CPEA as before. Additional markets (e.g. China, Brazil and other countries) will soon join, while we plan to progress the market coverage until end of the year to all applicable markets. Stay tuned for updates. In the above mentioned blog, I also outlined the services, which are applicable for CPEA and Cloud Credits. We are moving from originally twenty-two (22) to thirty (30) services, adding heavy-weights such as Cloud Platform Integration, Internet of Things, Big Data Services and Enterprise Messaging. With this we still have not accomplished the parity with our subscription offering we intended to achieve by mid of 2018. However, we progressed into critical use case domains such as integration or IoT, Big Data and integration which was not available at launch date. By the way, services become immediately available once our validation successfully completed. With this we continuously extend the service offering. Where can you check? Please consult the capabilities catalog for a service you are interested in and its pricing section, whether it is applicable for both license models already. Thanks Ralf! When if Fiori expected to be available under CPEA?